Christmas has arrived in London. The decorations are up, Christmas tunes and lights adorn the streets and the seasonal spirit can be felt. 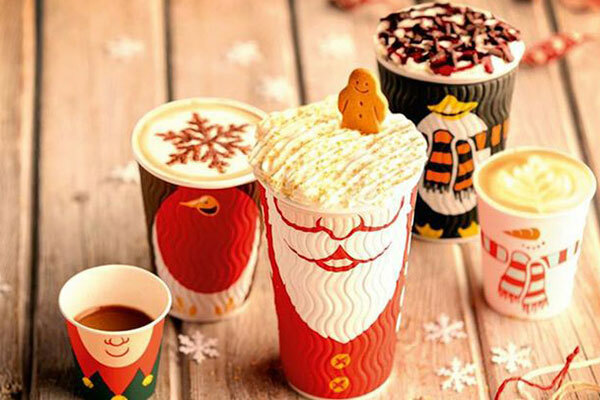 High-street coffee shops are getting involved in the Christmas fun by extending their brand power with feel-good festive cups, but some are more successful than others. Waitrose has struck gold with its free coffees to MyWaitrose card holders. Their Christmas takeaway cups feature a green and off-white design with cosy cottages, smoking chimneys, rolling snowy hills, dancing reindeer and fir trees. Understated, classy and quintessentially British without a touch of chocolate-box, these cups are Waitrose all over. Waitrose gives out 1 million free coffees every week, so it’s no surprise that you’ll probably have to queue for a good five minutes to get your machine-made coffee. But there is something about the Waitrose branded cup and its newly revealed Christmas design that makes you forget this is mere machine coffee. Somehow it tastes a bit more special and I put that down to the power of brand. The supermarket may have experienced a squeeze on profits connected to MyWaitrose’s free coffee and other perks, but it says the strategy is increasing sales. These Christmas cups are a triumph. I give Waitrose full marks for remaining visually on-message and capturing their brand in a cup. Costa coffee has been using festive cups for the last few years. The bright and cheery colours and gingerbread, elf, Santa and snowman designs are pure high-street Christmas. Costa’s brand puts forward that coffee is an art, the baristas are artisans and that there is passion and precision in each cup. Does it live up to this claim with its Christmas cups? In my opinion, no. They may look cheerful but they also look generic, which isn’t so true of the £7.50 ceramic and latex versions sold at the counter. Costa hasn’t stuck to its brand principles and its generic cups bypass its brand image but it does get full marks for being big on Christmas cheer. People may have a love-hate relationship with Starbucks but at least this coffee chain knows how to get branding, social media and marketing right. Its coffee might not be the best but the brand thoroughly engages with and understands its customer. Starbucks seeks to create an annual frenzy of anticipation surrounding the red cups with a social media campaign on a massively premature 1st November. And someone (from Starbucks maybe?) has created their very own online drumroll, www.countdowntoredcups.com. The brand might be trying a bit too hard with its red-cup related Instagram contest in the US, celebrating the ‘beauty and magic of the red cups’, but Starbucks’ artful use of the red cups to engage consumers proves once more that it understands to whom they are selling coffee. And the cups themselves, with their snowflake-spattered sleeves, are fun and festive. While not strictly a coffee shop, Pret a Manger gets a mention for its value-added Christmas coffee cups. Red, ribboned and showcasing #sharethehope, 5p from charity-enriched products like take-away coffees goes to its campaign to break the cycle of homelessness. There’s even a slightly gimmicky ‘To’ and ‘From’ option for you to pen a line on the cup to the people you’re buying coffee for. Like its coffee chain counterparts, Pret’s idea is Christmassy, fun, but something else besides. Pret’s staff also get full marks for festive spirit as the woman in front of me this morning had left her wallet at home, so the Pret employee waived the cost of her coffee and wished her a nice day. Christmas really is here! On a side note, I think Pret a Manger is unique as a business in the way their staff clearly understand and demonstrate the brand’s values while serving customers every day, something many other businesses could learn a lot from. I’ll drink to that! Happy Christmas.